Yang Zhang a Chinese student who has been in Ireland for three years, and Aimee Van Wylick from the Dublin Chinese New Year’s Festival joined Pat Kenny in studio to share some information on the celebration. Dublin will celebrate its 12th edition of the Chinese New Year’s Festival this year. The celebration will be marked by over 80 events, a lot of which will be free, across a two-week period. The festival mirrors the celebrations that occur in China and the opening ceremony will see a blend of cultures as it will kick off with a Chinese multi-percussionist and Irish traditional music. Chinese square dancing, which is a big part of the Chinese culture will also take place in Meeting House Square, and you will notice more subtle nods to the festival throughout the city in the form of Chinese lanterns, particularly on Drury Street which is home to Dublin’s Asia Market. How do the Chinese typically celebrate? On the 31st of December, families in China hang calligraphy posters and paper cuttings in their window with symbols that represent blessings and good fortune. It marks the start of the celebrations for the coming new year. Food traditions tend to vary depending on location. In the north of China dumplings are the food of choice, but in the south it is noodles and hotpots. In China the pig symbolises good luck as the pig is chubby which means well fed. In the past China lost a lot of lives to starvation so the year of the pig symbolises better times. 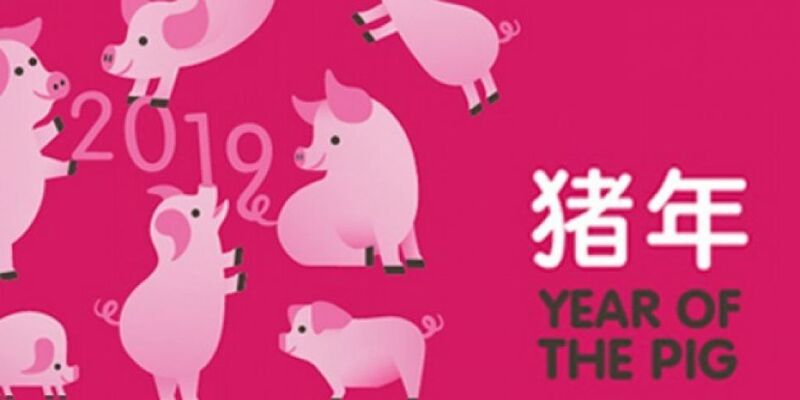 The Year of the Pig often sees a higher birth rate as it is classed to be a lucky year to have a baby as they will be plump and healthy. Typical characteristics of those born in Year of the Pig tend to be pleasant demeanor, compassion, and laziness! Where do their symbols come from? Typically, in western culture our zodiac signs tend to tie us to certain personality traits and characteristics, whereas the Chinese zodiac symbols are used to measure years. In the past almost all of the Chinese population were illiterate so using the animal symbols gave these people a way to identify when they were born without words as such.